Spring cleaning is not just for your overstuffed closets. As you set aside your bulky winter wears to pare down for warmer weather, slim down your heavy skincare routine and swap in new products to produce glowing spring skin. No matter how diligent you are about your skincare routine, winter is not kind to the epidermis. When it's cold outside, we turn up the heat inside and that dry, hot air can wreak havoc on the skin. Winter not only leaves skin dryer and rougher, but it can even make skin look older. Get your skin ready for spring by exfoliating, rejuvenating, moisturizing and protecting. To slough off that winter-dried skin, make head-to-toe exfoliation an important part of your spring skincare routine. Exfoliating is an ideal way to prep your skin before hair removal and self tans, but to prevent irritation, it is crucial to apply the scrub at least 24 hours before hair is waxed or skin is sprayed. While more abrasive scrubs do wonders to remove dry skin on the feet and other areas of your body you may have neglected during the winter, they should not be used on the face. Apply a gentler exfoliator on the skin. Used one to two times per week, our Cellbone Collagen Rejuvenating Rice Scrub regenerates your skin's cells and stimulates collagen production for skin that feels soft to the touch while appearing clearer and firmer. Rejuvenate spring skin by cleansing and toning twice daily. No matter the season, always use a gentle, fragrance-free cleanser designed for your skin type (dry, oily, normal, aging), and apply it with your fingertips. Rinse with cool to lukewarm water as hot water can actually dehydrate the skin, robbing it of needed moisture. Follow with a toner containing an alpha hydroxy acid. Alpha hydroxy acids are so gentle that they provide a sort of invisible peel; the ingredients do the job without causing your skin to noticeably flake off. Our Cellbone Collagen Skin Refreshing Toner contains the best of the acids, glycolic. As the smallest acid, glycolic penetrates the skin the deepest to reveal a glowing complexion. For deep rejuvenation, select a chemical peel for your skin type (and follow-up with mandatory sunscreen). Even on skin that appears dull, damaged or aged, chemical peels remove the outer layer of skin cells to promote the growth more supple, younger-looking skin. Because skin naturally holds more moisture in the spring, you don't need the same heavy moisturizer used in those chilly winter months. To best lock in moisture, apply a lightweight moisturizer before skin has completely dried after cleansing and toning. Perfect for spring, our line of serums, lotions and creams are not only lightweight and ultra hydrating, but they also fight wrinkles. To slim down the beauty products on your face, look for a tinted moisturizer with SPF protection. Petroleum jelly is an effective and inexpensive moisturizer for dry feet and hands. Let it soak into the skin under gloves and socks while you sleep. Give skin a mega moisturizing boost with our Cellbone Hydra Collegen Skin Hydrating Gel. Containing copper peptide, acetyl hexapeptide-3, and palmitoyl pentapeptide-3, the gel reduces wrinkles, repairs tissues and promotes collagen. You have probably heard it before, but it bears repeating: Never leave the house without sunscreen! Liberally applying a broad-spectrum SPF protection of 30 or higher 15 minutes before going outside is one of the best ways to prevent all those things you don't want for your skin: wrinkles, sun spots, and most importantly, cancer. Even if the spring weather isn't warm enough for a dip in the pool, it's still a good idea to use a water-resistant sunscreen in case you sweat or run into a spring shower (yes, even when it's cloudy, the sun can damage your skin). Our Cellbone Sun Protection SPF 45 goes on flawlessly under makeup, and it moisturizes while it protects. 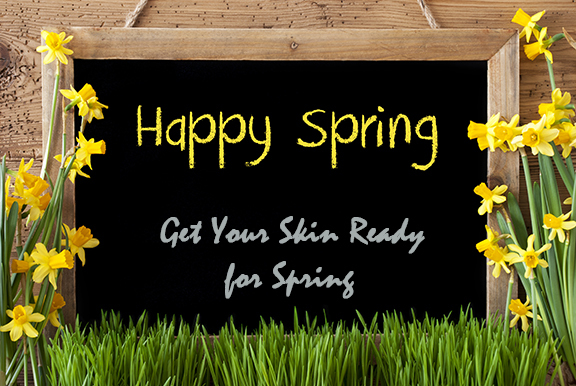 From Cellbone Technology's wide range of skin care products, you can put your best skin forward this spring!